16th September The Inaugural Longdrive Events Australia Golf Day! It's on the Inaugural Longdrive Events Australia Golf Day! We are running a relaxed golf day for all who want to attend, not just the longdrivers. Here is your chance to play with some of Australia's biggest hitters and see pitch shots in from 5 metres on that 370 metre hole. Cost is $70 per person which includes your game and cart hire, along with the chance to win a great cash prize for the winning team. Format will be a blind draw two man ambrose, as this will even the field along with giving newcomers the chance to meet some of Australia's biggest personalities in Longdrive golf today. EVERY LONG DRIVER COMPETITOR WHO ENTERS THE CHAMPIONSHIP AND THE GOLF DAY WILL HAVE A CHANCE TO HAVE A CRACK AT AN AUSTRALIAN 1ST. At 10am we will give every Long Driver 3 balls to see if they can make the 18th Green from a designated Tee on the 18th. 1st one to make the green with all carry, will win $1000 CASH!!!!! and the best Bragging rights in the sport! This day is OPEN To EVERYONE, so come along and invite your mates, a great chance to start the weekend off! 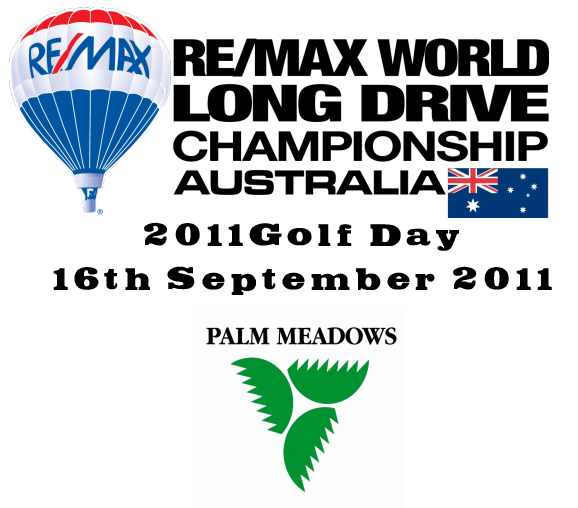 Hang around for the weekend and witness the RE/MAX World Long Drive Championship Australia FINAL! Hole Sponsorship packages are now available, contact us today to discuss yours needs. Contact us today, as spots are filling fast grubersgolf@gmail.com. Entries close 31st July 2011. Be Quick. Re: 16th September The Inaugural Longdrive Events Australia Golf Day! Thats great, count on seeing me there. Tens years back was the last time I played Palm Meadows and hit a stock driver over the water. I never made the green but with the right conditions there is a good chance with the equipment I have now. I'll spend the money in Vegas when I'm there for the World Finals. Sounds great but one question is it with our ld driver or standard driver? Which ever one you can hit Straight, so the houses on the right don't get hit! Of Course your longdriver, don't you want the Money Jerry Maguire! We have extended the entry till Friday 19th August, ACT NOW! email us at longdriveeventsaustralia@gmail.com to secure your start!